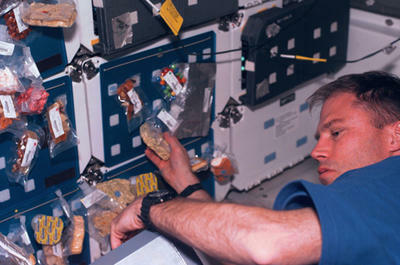 Astronaut Richard Searfoss, sussing out the food sitch on the Space Shuttle Columbia (1999). Ever wonder what astronauts eat when they’re on mission? Well, this is your chance to find out. You might even influence the future of space cuisine. NASA is looking for a few good cooks to explore food preparation and consumption on an isolated Mars space habitat. The study, to be run by Cornell and the University of Hawaii, will put selected candidates inside a fabricated environment designed to mimic astronauts’ quarters on the planet’s surface. For a period of 120 days, they will live within this setting, planning their interplanetary menus, cooking meals and eating them as though they were actually on a Mars station. But isn’t astronaut food just dehydrated Stroganoff and Tang waiting to be reconstituted with hot water? Often times, yes — and that’s the problem. When there’s a limited selection of choices over a long-haul timeline, “menu fatigue” sets in. (“Ugh, Stroganoff? Again?? Excuse me while I launch myself toward the nearest black hole.”) Faced with eating the same few foods for weeks, months, even years, human beings might experience diminished appetites leading to malnutrition. But that’s not all. What and how people eat can also influence mood. This is critical, since it’s already tricky enough to maintain a crews’ psychological and emotional well-being during lengthy missions. Being able to mix things up could do a lot to keep spirits and health levels up. This is what is leading scientists to seek out cheffy types for this planet-bound scenario. Although instant foods can’t go away entirely, particularly when the ship is en route, cooking becomes possible when the crew reaches its destination and settles in on the surface. Once there, they would have the gravity necessary for cooking. Interested? Well, before you pack up your spatula and chef’s knife, remember that this is an experiment set in a simulated Mars habitat. That means you need to be ready for all the other rigors of space, along with space suits and living in tight quarters. As such, candidates need to have “qualifications similar to those required by NASA for their astronaut applicants.” And you will have to eat the instant stuff, as well as make your own concoctions from the ingredients supplied and compare/contrast them. If you’ve got the requirements, have the willingness to go through a training period plus a 120-day seclusion, and you rock a penchant for cooking, then hit up this link for more info on the application procedure. But hurry — the deadline ends February 29.